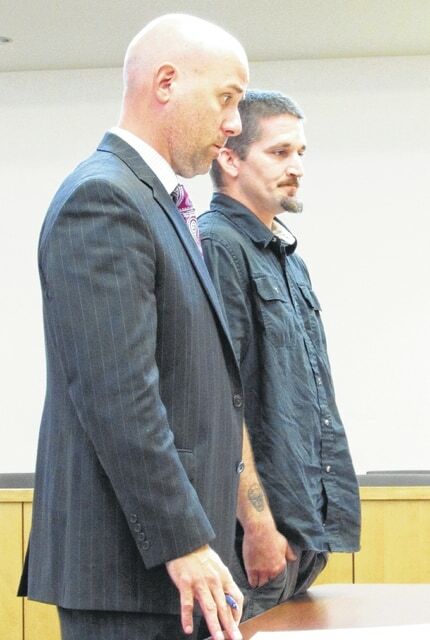 James A. Bettle is pictured with defense attorney J.D. Wagoner in the Hillsboro Municipal Court on Thursday. Co-defendants charged after they allegedly “jumped” a man appeared in the Hillsboro Municipal Court on Thursday and ultimately entered identical plea agreements. The Times-Gazette previously reported that James A. Bettle, 32, Wilmington, and Tony McCloud Jr., 29, Greenfield, were each charged with first-degree misdemeanor assault and fourth-degree misdemeanor trespassing following an alleged incident in May. An affidavit alleges they “jumped” a man at a local gas station. On Thursday, both pled guilty to amended and increased charges of first-degree misdemeanor aggravated trespassing. The assault charges were dismissed. Ninety-day jail sentences were suspended on the condition that they both pay $250 fines. An additional $750 is suspended on both cases. Bettle and McCloud are responsible for restitution for the alleged victim’s medical bills. They are also on reporting probation. Prior to sentencing, Bettle told the court that “some of” the allegations were not true, specifically alleged insults toward law enforcement when a clerk said he was calling the police. In other cases, Chad Thatcher, 36, Hillsboro, turned himself in on a bench warrant and was sentenced to 25 days in jail, according to court records. Thatcher was convicted of second-degree misdemeanor possession of drug abuse instruments last September, records show. Fifty-three days of a 90-day jail sentence were suspended at that time. In November, a warrant was issued for his arrest, according to records. Thatcher appeared on that warrant later that month and the previously suspended jail sentence was imposed. Records add that the following month Thatcher was furloughed to complete counseling at the Marsh House. In March, another warrant was issued for Thatcher’s arrest when he failed to appear for a review hearing. After appearing on Thursday, the remaining time on Thatcher’s sentence was imposed. He can be released with a negative drug screen and proof of counseling, records add. Also on Friday, John Luschek, 49, Hillsboro, entered an agreement with the state. He appeared for an arraignment on a speeding violation which, according to Hillsboro Municipal Court Judge David H. McKenna, was his third such charge in 12 months. The judge added that Luschek’s “traffic record indicates 33 citations” over the years. He then described the agreement offered by the state, which was to reduce a third-degree misdemeanor charge to a minor misdemeanor equipment violation. He added that Luschek had allegedly been traveling 27 miles over the speed limit. McKenna asked prosecutor Fred Beery about the deal. Beery said it had been agreed upon by the parties. After consulting with defense attorney J.D. Wagoner, Luschek ultimately pled guilty to the amended and reduced charge for an equipment violation. He was fined $150. Thirty hours of community service were suspended. His driving record will be run in October, and then every three months for the next year. McKenna told Luschek, “If you have another moving violation and I find out about it,” the suspended 30 hours of community service will be imposed. An agreement was also reached for William Gabbard, 51, Hillsboro. He pled guilty to first-degree misdemeanor operating a vehicle under the influence (OVI). An accompanying charge of reckless operation was dismissed. Sentencing was deferred to give Gabbard time to complete a three-day driver intervention program. He is scheduled to return to court in October, records show. Alexandra Tokar, 22, Hillsboro, also entered an agreement. She was originally scheduled for a court trial on a total of four charges: fourth-degree misdemeanor possession of drug paraphernalia, two minor misdemeanors for possession of marijuana and a seatbelt violation, and an unclassified misdemeanor for failure to maintain control. The judge said that Tokar’s case involved an accident. As per the agreement, Tokar pled guilty to failure to maintain control. She was fined $50. Also originally scheduled for a court trial was John Tatman, 44, Chillicothe. He was charged with first-degree misdemeanor stalking, according to records. The Times-Gazette previously reported that Tatman declined a plea agreement with the state in May. He also said at that time that he would represent himself. His case was dismissed. McKenna added that it was subject to refiling. A jury trial was rescheduled for Tracy Kyle, 50, Hillsboro. He is charged with improper fishing, a fourth-degree misdemeanor, and driving on a suspension, an unclassified misdemeanor, the judge said. A trial was previously scheduled for next month. On Thursday, it was rescheduled for October as per the request of Kyle’s attorney. A final pretrial is set for September. Finally, a $1,000 bench warrant was issued for Katina Shoemaker, 20, Chillicothe. She failed to appear for a pretrial on a charge of first-degree misdemeanor theft.